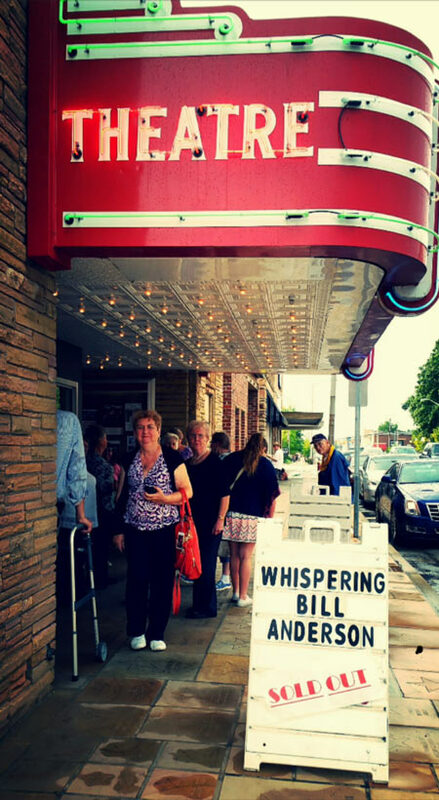 NASHVILLE, Tenn. (July 23, 2015) – On Saturday, July 18, the marquee sign at the historic Palace Theatre in Crossville, Tennessee read “SOLD OUT,” and country music legend Bill Anderson was the headlining name to blame. Bringing top hits like “Po’ Folks,” “Bright Lights and Country Music,” “Mama Sang A Song,” “The Tips Of My Fingers,” “8X10,” “Still,” among others, the million-selling recording artist, Grand Ole Opry member, and celebrated songwriter, performer, TV personality and radio host has been touring for over fifty years. Yet still today, he has the ability to capture the attention of millions of country music fans young and old. *Click venue name for ticket prices and more information. Known as “Whispering Bill,” a nickname appointed to him for his soft, gravelly and recognizable voice, Anderson achieved a rare historic distinction in April when his self-penned song “Country,” (co-written with Mo Pitney and Bobby Tomberlin and recorded by Pitney) broke through to the Top 40 on the Country Billboard chart. The song makes him the only songwriter known in the history of the genre to have had an entry in the Top 40 on the country charts for seven consecutive decades. Other career-defining songwriting hits for Anderson include George Strait’s “Give It Away,” Kenny Chesney’s “A Lot Of Things Different,” Brad Paisley and Alison Krauss’s “Whiskey Lullaby,” “Joey” by Sugarland, among others. At 23 years old, he became the youngest writer to earn BMI’s Country Songwriter Of The Year award – a record never broken until 20-year-old Taylor Swift was endowed with the same award in 2010, and to this day, he has still been able to write and record songs that appeal to both the genre’s traditional country fans and the genre-dominating generation of young listeners. Reviewers have long heralded Anderson for his humorous jokes and friendly banter with the audience throughout his live shows, matched by resonant stories of his life milestones and challenges encountered along the way. Anderson is currently touring in support of his new Gospel album, God Is Great, God Is Good, with over 40 Gospel favorites as well as his original 10-track project, Life, released on November 12, 2013. To purchase, visit iTunes, Amazon or BillAnderson.com. For show details and information on where to buy tickets, please visit BillAnderson.com. Bill Anderson is booked by The Agency Group.